Abigail first met Tristan on Social Media. He fell in love with her pictures and the awesome personality she displayed. The only barrier that they could overcome (because love conquers all) is language! He speaks a bit of Spanish, she speaks a bit of Spanish, she had limited English, and with the language of Love they managed. 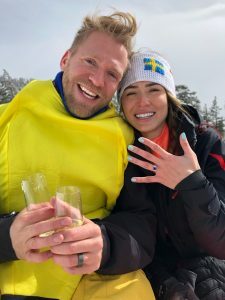 On March 9, in Lake Tahoe, where they were having a mini-vacation, he popped the question, and she said “YES!”. It was magical, it was snowy, and she came back flaunting that blue diamond! We wish them a happy life! We can’t wait for the big day!